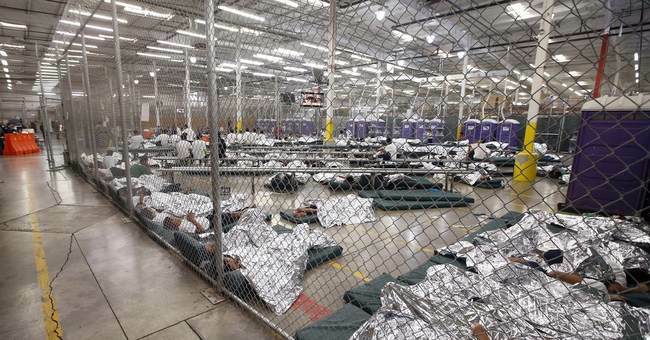 On Friday’s “MSNBC Live with Stephanie Ruhle,” former Republican National Committee chairman Michael Steele and former Obama 2012 deputy campaign manager Stephanie Cutter compared the Trump administration’s detention centers for illegal immigrant children to Nazi concentration camps. Steele also ominously warned viewers that their “kids could be next” to be placed in such concentration camps. CUTTER: We are, or used to be, America’s greatest democracy. We can’t find a solution to this problem without harming children? Without putting them into concentration camps? STEELE: And I would even say, Stephanie, to that point, it’s not even an interpretation of the law, it is a policy. STEELE: And a policy that has been invoked by the President of the United States and dictated to his attorney general, who goes out and quotes the Bible – by the way, a passage that was used to justify slavery in this country – to justify encamping children. I call this a concentration camp for kids because that’s exactly what it’s turning out to. When you give kids 22 hours of lockup time and two hours of air time, what else can it be? And if this is where this country is going, the American people need to wake up and pay attention. Because your kids could be next. The massive shelter retains a warehouse vibe -- noisy but highly organized, with scores of staffers leading skeins of boys to various activities. In recreation rooms, some boys watched a soccer match on TV; some took part in a tai chi class; others played pool or foosball (in one case with a cue ball). Still others sat in classrooms. Because of the crowding, the boys attend school in six-hour morning or afternoon shifts, five days a week. The bedrooms reporters were shown seemed antiseptically clean. Though they have a variety of scheduled activities to keep them busy, the boys spend almost all their time indoors at the former superstore, aside from one hour a day outside for PE and another hour of free time they can spend on the basketball courts or soccer fields adjacent to the shelter building. Many of the boys stared at the visitors with obvious curiosity, greeting reporters with "Hola" or "Buenas tardes" as they walked by. CNN also reported that kids are not kept in the detention center indefinitely. In fact, they usually stay there for only about two months until federal immigration officials either reunite the children with their real parents or other relatives in the United States or deport the kids back to their home countries. As an alternative, perhaps Steele, Cutter, et al. would prefer if we go back to putting illegal immigrant children in cages and having them sleep on the floor? But then again, what kind of monster would do such a thing?